After getting approved for my visitor visa to New Zealand, I also applied for a visa to Australia. My flight was from Manila to Melbourne before heading to New Zealand. But I’m planning to stay for only a few days. So instead of applying again for a visitor visa to Australia, I thought of applying an Australian Transit Visa instead. This visa lets people be in the country for up to 72 hours. That’s 3 days! It’s enough time for me already since I would only be planning to stay overnight in the country. The Transit Visa allows people to enter Australia with a maximum stay of 3 days or 72 hours. But the Australian Transit Visa should not be used as a 3-day visitor visa. You have to have a connecting flight or to travel by sea to your destination country (and not where you originated). 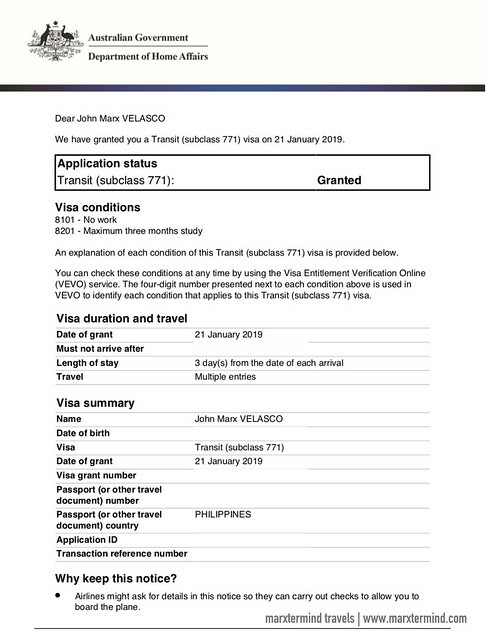 You can also use Australian Transit Visa even if you have a different airline in your connecting flight. But if you’re transiting through Australia for less than eight hours and will not need to leave the airport transit lounge except to board the connecting flight, applicants may not need to apply for a transit visa. To check the eligibility, you may visit this link. The only option available to apply for Australian Transit Visa is by online. The application form is available through ImmiAccount. The form is easy to fill up and very straightforward. Visa outcome will be provided through email and the ImmiAccount. Applying for Australian Transit Visa is also free. You don’t have to pay anything for the application. Nice, right? With the transit visa, I was able to save AU $140 for applying again for a visa to visit or have a layover in Australia. If you’re transiting through Australian no longer than 72 hours, here are the steps to apply for a transit visa. ImmiAccount is the front door to the online services of Australian Government including visa application. Create your account through this link using a valid email address. If you have an ImmiAcount already, log in. Start creating new application by clicking New Application > Visitor > Transit Visa (771). Then, it will direct you to the application form. Complete it truthfully and with the corresponding details. It will ask your current location, transit details, applicant and passport details, visa history and declarations. When filling up the form, you also need to input your flight details. There’s also part in the form that you will be asked if you intend to transit through Australia on more than one occasion. Since my return flight to Manila is through Australia, I answered yes. Before I started my Australian transit visa application, I thought I needed to submit a bank statement. When I was attaching my supporting document, it turned out that any financial document is not required to be submitted. It isn’t even on the list of the documents that I need to upload. When I was done attaching all the supporting documents, I submitted the form and waited for the result. 3 days after I submitted my application, I received an email from Australian Government Department of Home Affairs that my Australian Transit Visa is approved. The document has the visa conditions, visa duration and travel, and visa summary including the visa grant number. I was granted a multiple-entry transit visa valid for 1 year. When is the best time to apply for Australian Transit Visa? I suggest at least a month or two before the trip. Do I need to have a show-money? No. The Australian Government Department of Home Affairs doesn’t require financial documents to be submitted for this type of visa. How long can I stay in Australia with my Transit Visa? You can stay in Australia not more than 72 hours. Do I need to have confirmed flight bookings? Yes. 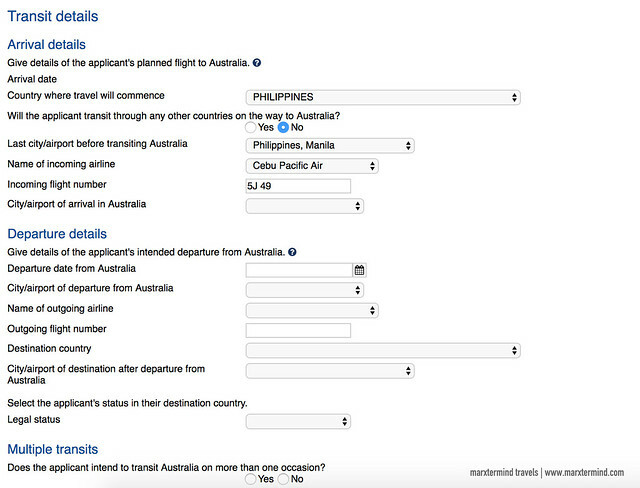 You need to upload your confirmed flight bookings showing that you are only transiting through Australia. Your flights don’t have to be in the same airline. For example, my flight from Manila to Melbourne is with Cebu Pacific while my flight from Melbourne to Christchurch is with Qantas. Are there specific countries that you can only travel from Australia with this visa? There are no specific countries. If you’re flying from Manila to Sydney or Melbourne, then your next flight should be in New Zealand or maybe countries in Americas or Europe. But in my opinion, why would you transit through Australia if you can fly conveniently and book a cheaper flight from Manila going to America or Europe. So I guess, the transit visa is appropriate to use when you’re going to other countries in Oceania region. Is the transit visa application really free? Yes. There’s no fee for a Transit Visa application. Do I still need a transit visa if my transit is only less than 8 hours and I will not leave the airport? 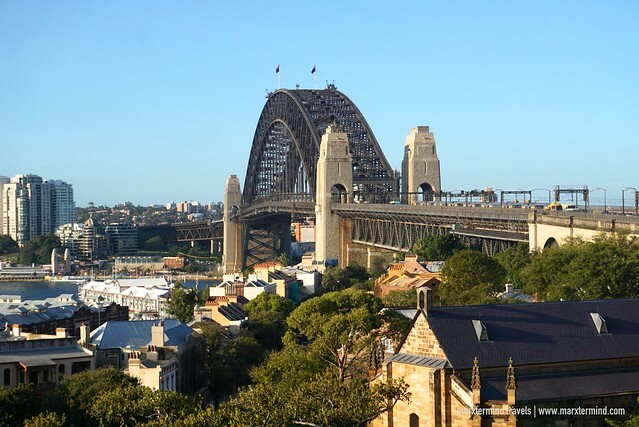 You may not need to apply as long as you’re transiting through Australia for less than eight hours and will not need to leave the airport transit lounge except to board the connecting flight. For more information, you may also visit this website. 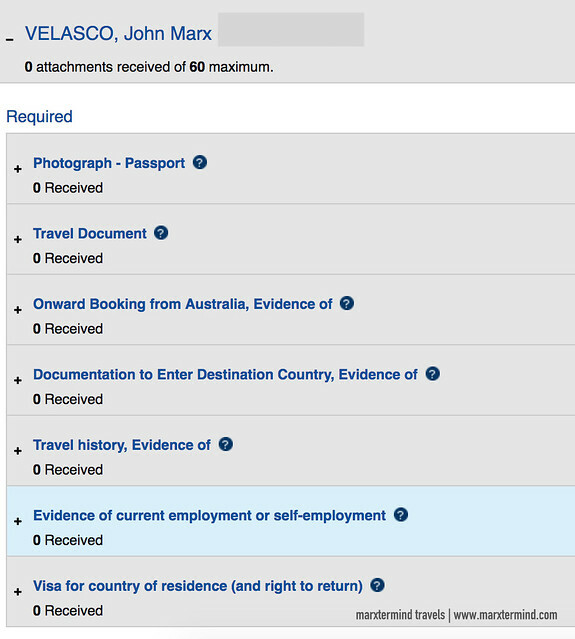 Please note that the steps in this blog are for application for Australian Tourist Visa only. If you are applying for a visitor visa, you may check this link. Application for other types of visa, please contact Australian Embassy in the Philippines or visit the official website. Previous story How to Apply for a New Zealand Tourist Visa in the Philippines?